Lavender has a long and distinguished history as an aromatic herb plant, but it can also make itself wonderfully at home in the flower garden. Its needle-like bluish-grey foliage topped by fragrant, long-blooming flowers in violet-blue shades, plus a graceful low-mounding form, makes for a most elegant edging plant. Used along the edge of a patio or alongside gravel paths, it will spread its aromatic scent for you to enjoy. The best cultivars for northern gardeners are the common or English types, (Lavandula angustifolia and L. x intermedia, a hybrid between L. angustifolia and L. latifolia), which are hardy to Zone 5. Popular garden cultivars include ‘Hidcote’, with lilac purple flowers; ‘Munstead’, with violet-blue flowers; and ‘Grosso’, which has light-purple flowers held higher on longer stems. Unlike some perennials, which are long-lived – peonies and hostas, for example – don’t expect lavender to thrive for years. The plants tend to be at their best for maybe three to five seasons. Flowering begins to decline after about five years, and the plants grow straggly and gets more woody as they age. If your soil is heavy, and you live in a region with cold, wet springs, or very humid summers, you might lose your plants sooner. But lavender is widely available, affordable and grows quickly, even from cuttings, so you need never be without it. Light: Native to the Mediterranean, this perennial is a heat-lover that needs full sun – at least six hours daily. Soil: Tolerates a variety of soil types, but its number one requirement is for excellent drainage; sandy soils are ideal, clay soils less so. However, if you have a workable, but not too heavy clay like I do, you can grow it, provided that you amend your soil with plenty of organic matter and sharp sand, or plant into a raised bed for improved drainage. The thing to avoid is planting in heavy clay that gets water-logged in winter – this will kill the plants. 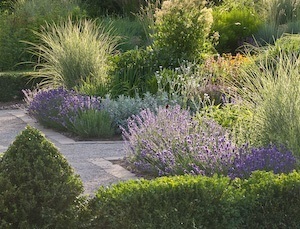 Water and fertilizer: Like most herbs, lavender is very drought tolerant once established. It also grows well without added fertilizer, although you can enrich your soil with organic matter such as compost before planting, and give the plants a little organic fertilizer after planting to help them get established. Pruning: Avoid cutting the plant down to its roots, or removing all the previous season’s woody stems. Don’t do any cutting back until it’s warm in the spring and new growth has started to show. Then cut foliage tips back by one third to one half to promote fresh growth. Once you see good growth happening, prune again by about one third to give plants a nice mounded shape, and to encourage fuller growth at the center of the plant. Deadheading and summer maintenance: Deadheading can be quite time consuming, so the best thing to do is to shear the plants when most of the flowers are finished. This also gives plants a quick shape-up. Do this in July, but avoid pruning after late August, and never cut the plants back before the winter, as this can kill them.